Deveron UAS Corp., through its subsidiary and a leading agriculture data analytics provider, Veritas Farm Management Inc., have combined forces to provide clients across North America a new tool to help manage their in-season corn nitrogen application. You will receive one data collection through UAV or Drone (remote sensing), plus a Nitrogen Script which will automatically distribute your nitrogen more efficiently, reducing the amount where it is not needed and increasing it where it is. The net result will be either a decrease in overall nitrogen used, or an increased in yield potential. In addition, you will receive a post-season analysis on the scripting effectiveness. We will create a script based on the information provided in your order. You will receive a Variable Zone Spray Script and Field Health Report, along with the raw data layers, which you may use towards decisions on future crop rotations. Once the crop has been harvested, you will also receive an additional feature, validating the decision process through a full statistical analysis. 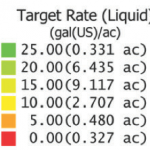 Yield data is required for this portion of the program, but available at no cost to you. The all-in pricing for a package that includes the UAV data collection and a Nitrogen Script, plus a post-season statistical analysis is only $4.49 per acre. You get both a complete, more accurate application for your nutrient program and an extra data layer, which can be used to further enhance your precision agriculture programs today and in the future.